Percolation theory is used to describe critical transitions that are geometrical or structural in nature. An example of such a transition occurs in electrical networks. In these even a very small increase in the number of links can change the network from insulating to conducting. Another example is the 'jamming transition'. In this transition the rigidity of a collection of spheres, for example, changes if they are packed together densely enough. Models that describe such transitions mostly exhibit continuous behaviour: the electrical conduction or rigidity increases gradually. The structure in this type of model exhibits a mixture of large and small islands, called clusters. 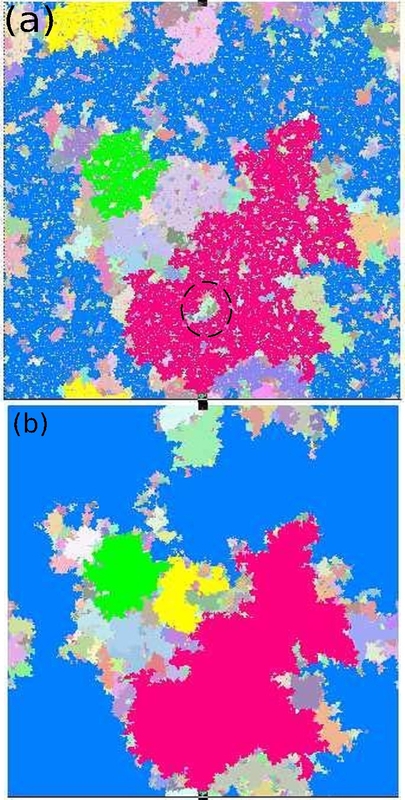 Exactly at the transition point, the mixture of large and small clusters is called fractal, and the biggest clusters are as big as the system size. Researchers from this programme have recently discovered a new class of percolation transitions, which combine the apparently irreconcilable aspects of abrupt, discontinuous and gradual, continuous transitions. The new transition exhibits a sudden jump in rigidity, whereas characteristics occur that are associated with the continuous transition, such as a gradual growth of the largest cluster. The crucial difference with other models is the absence of enclaves, clusters that are entirely surrounded by a larger cluster. Besides the theoretical importance of this discovery, this model can possibly explain recent findings in experiments on networks of biopolymers as well. The researchers discovered that molecular motors drive self-organisation in such networks. These observations were made in collaboration with AMOLF. The structure of a cluster at the critical point of the random percolation model. In image (a) an enclave can be seen (within the circle). In image (b) this enclave has been absorbed.